Flash back to the golden age of T.V. and radio by offering guests of any age a 1950’s tea party. A 1950’s theme will easily lend itself to creativity, but needn’t cost a lot or take a great deal of preparation. To help set the tone, encourage guests to dress accordingly. If you plan to host a variety of themed tea parties, you may want to visit the local thrift shop or antique store for clothing. This way, guests who are so inclined can throw on a sweater or change into some bowling shoes. If you’re able to provide some costuming, your guests will have no reason not to attend. Depending on the amount of room available and where the party is held, there are a number of 1950s inspired activities to choose from. With minimal space, you can let guests play with hula-hoops or lip sync to 1950s music classics. You can watch classic “I Love Lucy” episodes or listen to classic radio comedies available from ww.Radiospirits.com Alternatively, set the tone of a drive-in movie using cardboard cutouts of movie stars and have speakers set at each table. Active your imagination and the sky is the limit. Tea tasting will be, of course, a primary activity. Black teas were most common during the 1950s, so consider offering a variety of these teas. Offer unique blends of black teas that your guests may not be familiar with. But be sure to serve an herbal option those wishing to avoid caffeine. You can have a lot of fun with the origins of teas. Until the Korean War, the U.S. imported most of its black tea from India. During and after the war, Argentina became as primary source. Offer your guests a wide range of black teas from around the world. They may be surprised at the selection! Add some posters of 1950s icons and you’re good to go! With a few low-cost decorations, you can create a theme for any inspiration from the period, such as bowling balls and bins decorating the sides of the room, toy cars from the time, or even a “homey” feel giving the room a “Leave it to Beaver” flair. Many party stores have cutout figures of jukeboxes and 1950s icons, which can be fun to place around the party and are affordable. 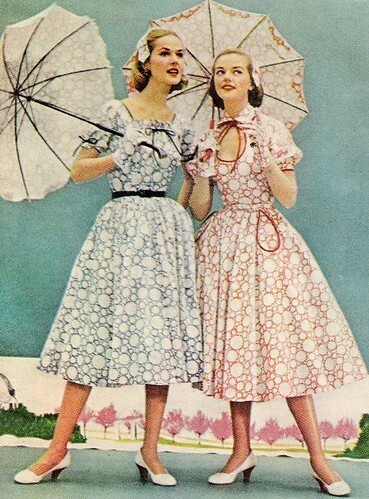 You can also use any of the 1950s inspired clothing and shoes as decoration. Simple “home” decorations can also be included, as the 1950s Americana focused on family values. Depending on your budget, you may be able to pick-up some great 1950s furniture at thrift stores or flea markets. There is a lot of wonderful music to choose from! A 1950s compilation may be the simplest, but other suggestions include Elvis Presley, Connie Francis, Mary Wells, Patsy Cline, the Supremes, Debbie Reynolds, Bill Haley and the Comets, Ray Charles, Chuck Berry…the list goes on! The activities of your party will influence music selections. If you’re hosting dance hop, then some of the popular “pop” songs of the day are good choices. If you’re using music for background, then anything from the 1950s will work. Think Betty Crocker and soda fountains! Many of the primary foods served in the 1950s were traditional meat and potato style meals. Barbecue was also big. These foods may be a bit heavy for a tea party, so consider using scaled-down appetizers. If you don’t want to make a big fuss, consider the sweet route; many candies that were popular in the 1950s can be found today, such as wax lips, Necco wafers, licorice snaps, and bubble gum. Also, think about ways to get creative when serving teas, such as using tall sundae dishes or mugs. While Chai teas were not the custom of the time, they can make a great presentation in a sundae dish. Creativity is the key to any successful tea party and a 1950’s theme is just the same. Take these ideas and run with them, let your imagination go wild and be sure to email me with your 1950s fun.